Those who crave brownies or hot cocoa may be happy to hear that heroes too small to be seen may help to protect the world's chocolate supply. Scientists at the Smithsonian Tropical Research Institute (STRI) in Panama found that exposing baby cacao plants to microbes from healthy adult cacao plants reduced the plant's chance of becoming infected with the serious cacao pathogen, Phytopthora palmivora, by half. The researchers' study was published in Proceedings of the Royal Society B on July 5. "When human babies pass through the birth canal, their bodies pick up a suite of bacteria and fungi from their mother. These microbes strengthen their immune system and make the baby healthier," said Natalie Christian, doctoral student at the University of Indiana and lead author of the paper. "We showed that an analogous process happens in plants: adult cacao trees also pass along protective microbes to baby cacao plants." Researchers at STRI have investigated the interactions between plants and their microbes for the past 20 years. They were the first to show that in tropical forests, where cacao grows, every leaf is home to hundreds of different fungi and bacteria, and that applying helpful microbes to leaves in field treatments protected cacao from disease. Researchers found that specific fungal species, such as Colletotrichum tropicale, protect plants from their enemies—the pathogens and insects that eat them. 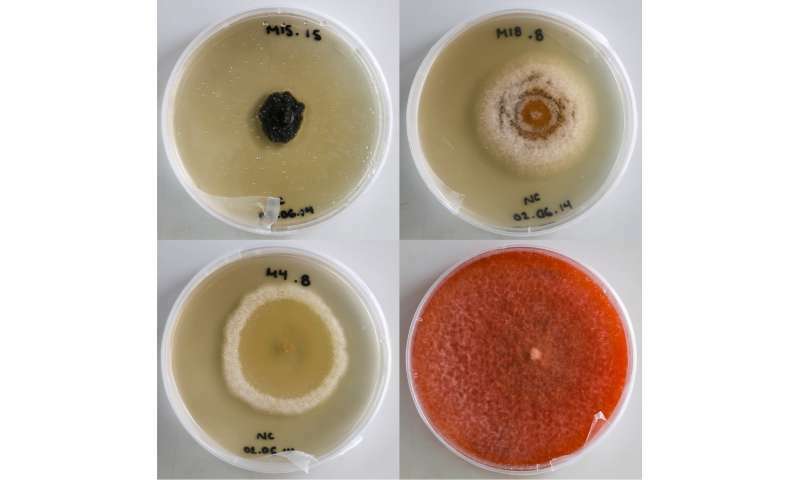 Research at STRI has also shown that, as with humans, microbes stimulate plants' ability to defend themselves and has demonstrated the magnitude and extent of endophyte effects on host genetic expression. On June 30, following on work published in the scientific journal Nature by STRI post-doctoral fellow, Scott Mangan, a group of 50 researchers from 12 countries published a paper in Science (lead author, Joe LaManna, Washington University in St. Louis) showing that close plant relatives make bad neighbors and that the negative interactions between relatives are stronger in the tropics, which may explain why tropical forests are so rich in species diversity: Because plants do not do well next to their relatives, there is more space for non-relatives to fill. "Where you get a build-up of any given species, you get a build-up of the bad guys, their enemies," said STRI staff scientist and co-author, Allen Herre. "A mother tree can infect her babies with pathogens that can kill them if they are too close by. In this most recent study we show that parents can also have a positive effect by supplying babies with good microbiota." The team first grew cacao plants from sterile seeds in sterile chambers so that they had no resident fungi in their leaves. Then they divided the baby plants into groups, placing dead leaves from healthy cacao plants in one set of pots, mixed leaves from the forest floor in another set and no leaves in the third set, giving different sets of microbes the first chance to land on and colonize the "virgin" leaves of the young plants. Then the researchers took the plants out into the forest, mimicking the natural process by which young leaves are gradually colonized by fungi swirling in the air or contained in water droplets when it rains. Finally, the team brought the seedlings back into the greenhouse and infected them with the pathogen Phytopthora palmivora, (literally, "plant destroyer"), which accounts for 10 to 20 percent of the loss in cacao production worldwide. Three weeks later, they took stock of the damage. The plants exposed to healthy cacao leaves experienced significantly less damage than plants grown without the exposure. In addition, the leaves of the seedlings grown with leaf litter from healthy cacao plants showed only half of the damage sustained by plants grown with mixed-leaf litter from the forest floor. To see if this result could be explained by the microbes inside the leaves, the team used two different methods: the traditional method of placing leaf pieces on agar-coated petri plates to see what fungi grew and directly sequencing the DNA from surface-sterilized leaves. "We discovered both by culturing the microbes from the leaves and also by directly sequencing fungal DNA from plant tissue, that one of the most common fungi on the cacao seedlings was their protector, Colletotricum tropicale. And not only that, but it was also much more common on the leaves of young plants grown with leaf litter from healthy cacao adults," said Christian. "What this means is that C. tropicale from leaf litter from adult trees is able to quickly get into young leaves and crowd out other microbes, including pathogens, thus keeping them from colonizing." "Not only did this show us that starting seedlings out surrounded by leaves from healthy adults may vastly improve their health—a result potentially very important to the cacao industry—for the first time, we are beginning to understand how microbial communities assemble on leaves of cacao and other species in nature and what may influence their ability to protect plants," said Herre. This article has nothing to do with litter. Goddamn clickbait leads to and article whose anonymous author at the Smithsonian is amazed to discover that microbes participate in other organisms' immune system. Duh. This article has nothing to do with litter. Leaf litter is the part of the forest floor in which the recycling of nutrients begins, aided by fungi and bacteria. The title of the article is a playful use of the accurate description for the top layer of the soil and a common-language description of microscopic organisms. And I'm happy to know that science is beginning to point the way to agriculture based on ecosystems rather than monoculture.